Anderson was back live in the 10pmET hour for a second edition of AC360. was back at 8pmET hour for AC360 leading up to the State of the Union address and then back after the address for a 10pmET hour of AC360. Anderson Cooper anchored AC360 in the 8pmET hour from the NYC studio. 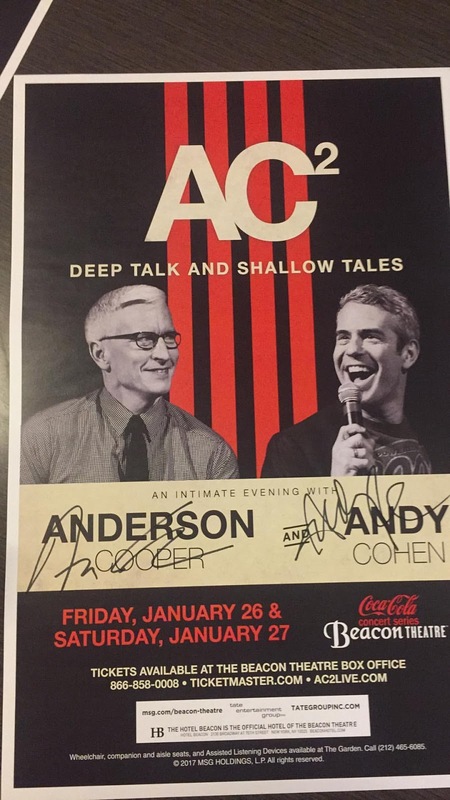 The program was taped earlier in the day as Anderson and Andy Cohen are at the Beacon Theater in NYC for their AC2Live tour. The very capable Jim Scuitto was in the AC360 anchor chair in the 8pmET hour. To close the program, Scuitto aired an short interview Anderson Cooper did with Jack Hanna about trophy hunting to promote the CNN special airing Sunday night. For those new to the blog or wanting to look back on some of Anderson's reporting during his time in Haiti, we covered it extensively. You can find a post from the 6th month anniversary by clicking here, from the two year anniversary by clicking here, from one month after the quake by clicking here, and his first report from Haiti after the quake by clicking here. Anderson Cooper anchored AC360 in the 8pm and 9pmET hours in the NYC studio. Anderson Cooper was back in the AC360 anchor chair in the 8pm and 9pmET hours. Anderson is a guest on The Late Show with Stephen Colbert tonight. We will be adding video of his appearance (see below) and also start a post of NYE with Anderson and Andy tomorrow.